Since February, one of the world’s largest consumer goods companies, Procter & Gamble has been facing down a public challenge from its investors – and from one new shareholder in particular. Dubbed an “activist investor”, Nelson Peltz’s investment management firm just publicly asked for a seat on the P&G board. His proposal? To reboot revenues and market shares, and ultimately the company’s share price. P&G is repelling Peltz’s public campaign, but it is not the only company to experience this – DuPont, Nestlé, PepsiCo or Unilever have all been targets of similar sensational shareholder campaigns. 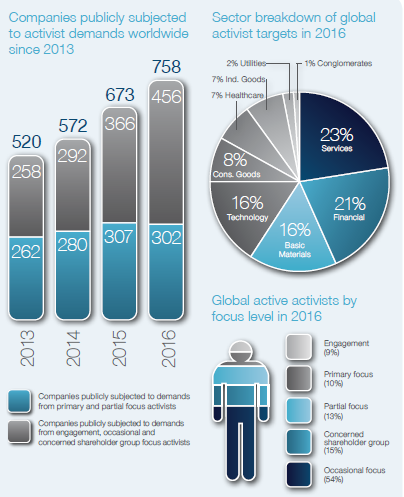 There were 758 shareholder requests against public companies in 2016. That’s nearly double the number there were in 2013. How have these formerly niche campaigns gained such momentum? So-called shareholder activists, meanwhile, manage capital of more than $170 billion, compared with less than $3 billion in the year 2000. But how effective or precarious are such activist campaigns and what can firms do about them? First of all, shareholder activism is nothing new – it’s existed ever since shareholders have had voting rights in the companies where they hold shares. But, things were different in the past: shareholding was more concentrated and exclusive, and most influencing by shareholders took place behind closed doors. In 1976, shareholders held shares for 3.9 years on average, which feels like an eternity when compared to 2015's average of 7.4 months. In times of high-frequency trading shares may be held for just milliseconds. 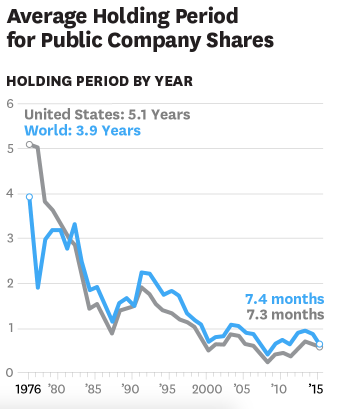 In short, shareholding has become more dynamic and share capital less patient – both factors that put listed companies under pressure to generate returns in much shorter time frames. Amidst these tensions, an impressively influential shareholder underdog has appeared: the shareholder activist. We see this most famously in hedge funds confronting corporations using unprecedented and effective tactics. Shareholder activists often appear on a company’s radar when they have already accumulated a threshold amount of shares which have to be reported to the stock exchange commission. This is, usually, a holding of +5% of free-floating shares and leads to the investor’s identity being revealed. They can be destructive - especially when it comes to short-term campaigns. These may force a firm to take any instant triggering positive share-price reaction, with little care for the potential side effects for the wider organization or its employees. Take the impact of hedge funds focused purely on financial engineering as an example: they promise to their clients to deliver high returns in a shorter timespan (usually against a 20% profit fee, for any increase in value achieved above a fixed percentage). Such extreme pressure of this short-term focus can affect a company’s long-term health or growth. Acting in the short-term for economic gain can jeopardize a firm’s overall robustness - particularly if the shareholder activists demand a return of capital from predetermined investments in research or innovation to provide an immediate payout in the form of dividends or share buyback. For management or a board, buying into such short-term manoeuvres can put the company’s long-term prospects at risk. Can activism be a positive influence? Whether activist campaigns create economic value remains unclear. Empirical analysis offers mixed results, with McKinsey and Bain recording some superior Total Shareholder Returns (TSR) over a three-year period, following an activist campaign (of max. +1.5% compared to industry average returns). But these returns do not necessarily meet the pre-campaign TSR levels and it remains difficult to capture whether such an increase in TSR is exclusively the result of the activists’ work or subject to other corporate measures. General activist triumph is easier to capture: Studying shareholder activism in the U.S. between 2005 and 2014, BCG report that roughly two out of three activist campaigns successfully achieved their objectives - and did so twice as fast as 10 years ago. The influence of active shareholders may not necessarily be detrimental to a company - it can bring benefits. There are moderate activists and institutional investors such as pension funds or sovereign wealth funds that act as guardians of long-term value creation. Many cases show their voting behaviour to be more orientated towards the long-term. This influence has helped protect companies from controversial practices, especially in terms of excessive executive compensation or megalomaniac investments. Even hedge funds, the admired and hated acrobats or pirates of the shareholder activism world, can offer something valuable. They can provide candid analysis of a company’s state of health and highlight corporate pain points, in particular, deficits in asset valuation and capital allocation, growth options, leadership competency or organizational efficiency. Using, often eccentric, public campaigns, hedge funds directly confront a company’s management or board with radical, uncomfortable change. Hedge funds must believe in the potential of the company to fix an existing disequilibrium in corporate resources and re-boost returns, at least in the short-term. Shareholder activism has become incredibly sophisticated and spread across regions, industries and corporates (see FTI’s global activism map) - every company can be a target. 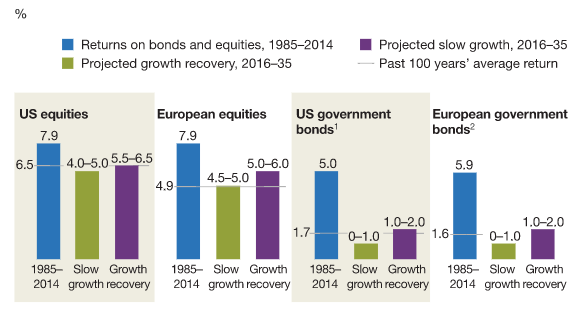 This is even truer in the current climate with the desperate chase for returns expected to continue – both future equity and bond returns (2016-35) are forecast to be substantially lower than ever before. With shareholder activism likely to intensify further, what can corporations do about it – especially to stop the increasing flow of capital towards shareholders focused on the short-term? Firstly, they must accept the legitimate rights of shareholder activists to promote their interests - especially through their voting rights. Corporate law grants shareholders the right to vote on strategic and governance items. Secondly, most campaigns contain some elements of truth and can act as a wake-up call, especially to corporate inertia. It might be the moment for the management and board to critically reflect on their firm’s equity growth plans. Recent cases show that, with a solid equity story in place, corporations under attack can reject a shareholder campaign, even if it involves influential investors like in the cases of Unilever or PepsiCo. But two-thirds of companies do end up responding to the appeal of shareholder activists, mostly because their corporate management or boards are disunited or too collusive in their corporate steering. So, what about fighting the activist? History and theory tell us it is rarely worth it. Resistance is appropriate when the activist purely intends to transfer immediate value to the shareholder, at the detriment of the company’s attempt to create value over time – in other words, when time horizons and risk tolerance differ substantially between the firm and the activist investor. To win such a battle with activist shareholders, companies need to involve the other, remaining shareholders – especially asset owners who have an interest in stable value creation over time. They have become too distant from the assets they own, creating space for asset managers interested in the short-term. With a growth in distant or outsourced asset management, short-term shareholder activism has been inadvertently nourished. The side effects are similar to those experienced by most multinational enterprises when outsourcing essential parts of their value and supply chains: human rights violations and environmental harm. Just as enterprises need to reduce the distance between themselves and their suppliers to avoid these problems, asset owners need to be close to their asset managers – especially those operating directly within the company, such as the management and board. To document the increasingly visible superiority of long-term orientated businesses, corporate long-term performance needs to be systematically measured and communicated to the capital markets - both asset owners and managers. Such compass for superior corporate long-termism is what the Forum’s Compact for Responsive and Responsible Leadership aims to achieve. Signed by more than 130 CEOs and chairpersons, it is an attempt to steer companies and their investors jointly towards sustainable value creation over time and to create resilience against short-term distractions. A joint compact can help nourish and cultivate a systemic focus on corporate long-term leadership, from strategic positioning to risk management; from executive incentivization and board composition to shareholder rewards. Ultimately, it shall foster a lively and deliberative culture of debate between the firm and its investors, focused on substance and long-term value creation – not just short-term value transfer.